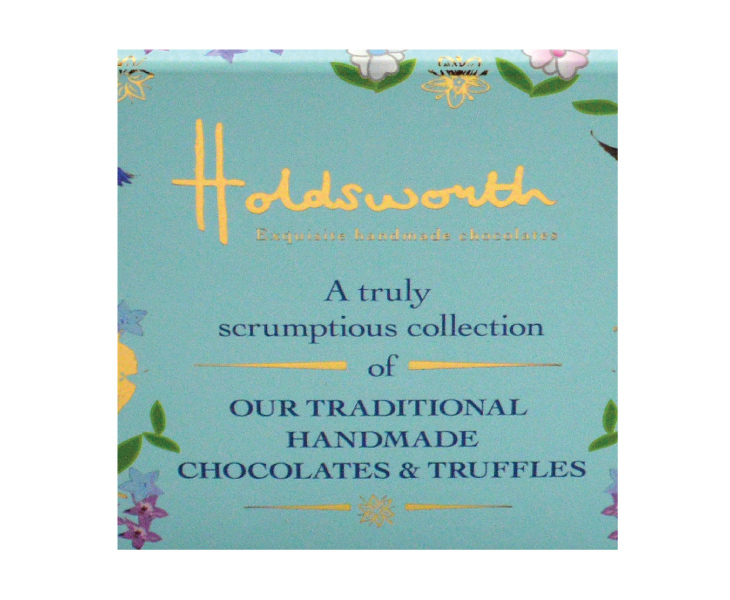 The Truly Scrumptious range is one of Holdsworth Chocolates best selling gift boxes. 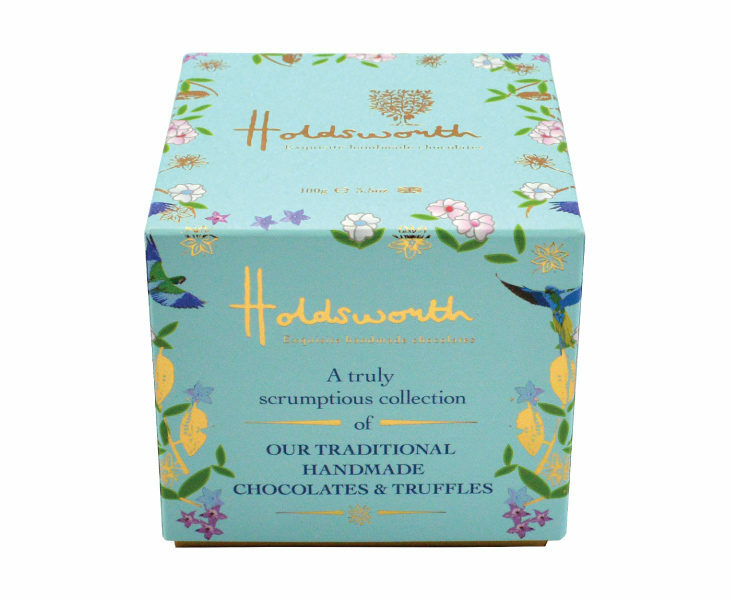 This collection contains a number of customer favourite chocolates includes; Milk Caramel Cup, Hazelnut Whirl and Marc de Champagne Truffle. 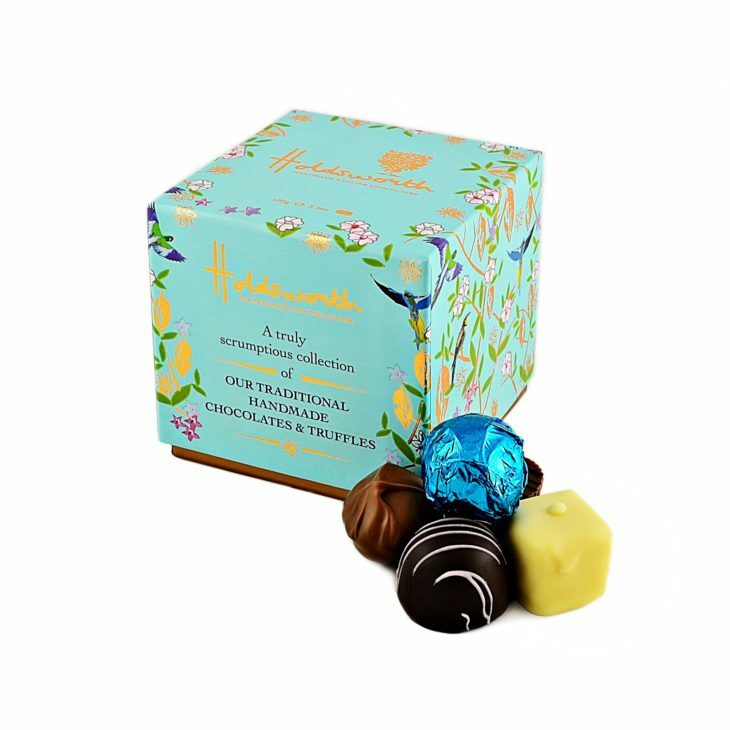 All beautifully presented in a hand-finished foil embossed cube, displaying the Holdsworth unique Theobroma tree along with the pretty Bird’s print on a duck egg blue. 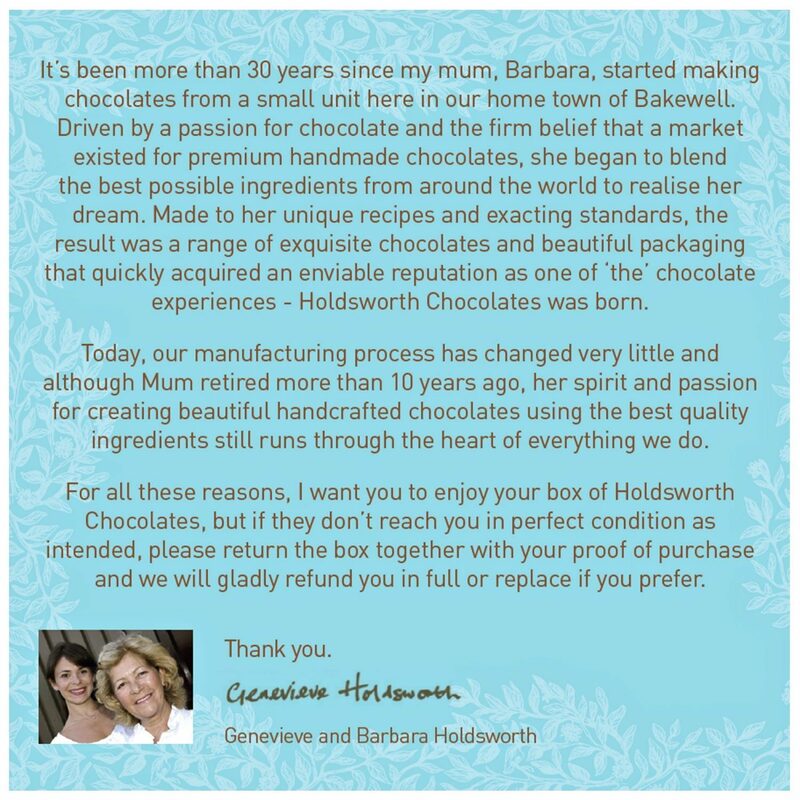 This beautiful box also comes in 55g – Click to view. Ingredients: Dark Chocolate (Cocoa Mass, Sugar, Cocoa Butter, Emulsifier: Soya Lecithin, Natural Vanilla), Milk Chocolate (Sugar, Cocoa Butter, Whole Milk Powder, Cocoa Mass, Emulsifier: Soya Lecithin, Natural Vanilla), White Chocolate (Sugar, Cocoa Butter, Whole Milk Powder, Emulsifier: Soya Lecithin, Natural Vanilla), Butter (Milk), Fondant (Sugar, Glucose (Wheat), Water, Preservative: Sulphur Dioxide), Caramel (Glucose Syrup, Sweetened Condensed Skimmed Milk, Sugar, Water, Cocoa Butter, Modified Starch, Thickener: Agar, Flavours, Emulsifier: E471-Sunflower Lecithin, Salt, Acidity Regulator: Citric Acid, Preservative: Potassium Sorbate), Hazelnuts, Fudge (Sugar, Glucose Syrup, Sweetened Condensed Milk, Palm Oil, Butter (Milk), Emulsifier Soya Lecithin, Flavouring, Salt ), Alcohol (Neutral Spirit, Crème De Cacao, Rum, Marc de Champagne), Fruit Purees (Glucose Syrup (Wheat), Invert Sugar Syrup, Strawberries, Beetroot Juice Concentrate, Natural Flavouring, Ethanol, Acidifier: Citric Acid, Colouring Plant Concentrates (Apple, Safflower, Lemon)), Natural Flavouring (Strawberry, Rum (Propylene Glycol)), Strawberries, Raspberries, Salt Flakes, Natural Colour (Beetroot), Citric Acid. Lovely…we think these chocolates are delicious and the box beautiful. My wife and I were at a Homegoods store, here in Florida, where we live, and decided to pick up this beautiful little box, just because of how elegant it looked (well… and because we love European chocolate). We will be buying more, for sure!